That 8x10 looks adorable on that wall. Let's resize it to something more appropriate! To resize a product, you must choose the individual product to resize. Click once on the product to select the entire gallery; click a second time to select the single product. You can now click "r", or click on the Resize Product button on the bottom left. Grab any of the 4 corners and drag to resize the product. The Designer will show you the size information (unless you are in IPS mode and have turned off showing the size) at the top of the screen. Note that if you have an image in the product the Designer will keep the image but reset the crop as you resize it. Please be aware that the only sizes you can use in the Designer are sizes of products you have built in Manage Products. 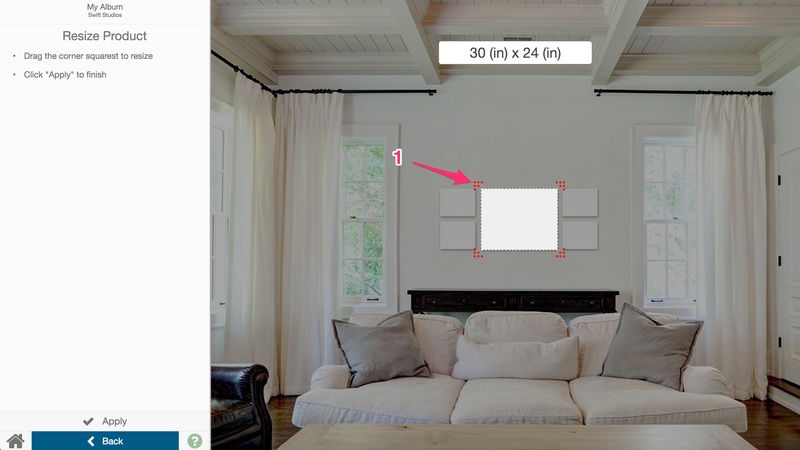 If you can't resize to the particular dimensions you want, that means you need to build that size of that product in Manage Products to show it in the Designer.